Karina Borowicz of Belchertown, Massachusetts won the 2013 Codhill Poetry Award for her manuscript Proof (finalist in 2013 for the National Poetry Series as well as the Nightboat Poetry Prize). She received $1,000 plus 50 copies. Author of The Bees Are Waiting (2012), selected by Franz Wright for the Marick Press Poetry Prize, her poems have appeared in AGNI, Columbia Poetry Review, Hanging Loose, Hunger Mountain Poetry, Indiana Review, New Ohio Review, Poetry Lore, Poetry Northwest, RHINO, The Southern Review, and elsewhere. 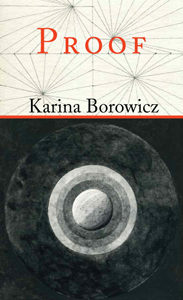 Karina Borowicz holds an MFA from University of New Hampshire and is a translator whose work has been featured in Poetry Daily. Thanks to all of you who entered the competition. We could not have offered the prize without your support. Beginning this reading period, the annual award will be given for a full-length (48+ page) poetry manuscript. The next deadline is December 10, 2014. Please consider resubmitting your work this year. All manuscripts are read anonymously and at least twice.